Trying to chose between the CC Skywave and Tecsun PL-310ET? The Tecsun PL-310ET is (and has been for years) one of the best budget shortwave portables out there. For the price of $40-45 US shipped (via eBay, for example), you really can’t go wrong. It’s certainly a benchmark among the ultralight DSP portables. I prefer the Skywave over the PL-310ET on the mediumwave band. Its selectivity and AGC, in my opinion, have a distinct edge over the ‘310ET for MW DXing. Because of these particular advantages, the Skywave has become my travel portable of choice when SSB reception isn’t a priority. In short, though? 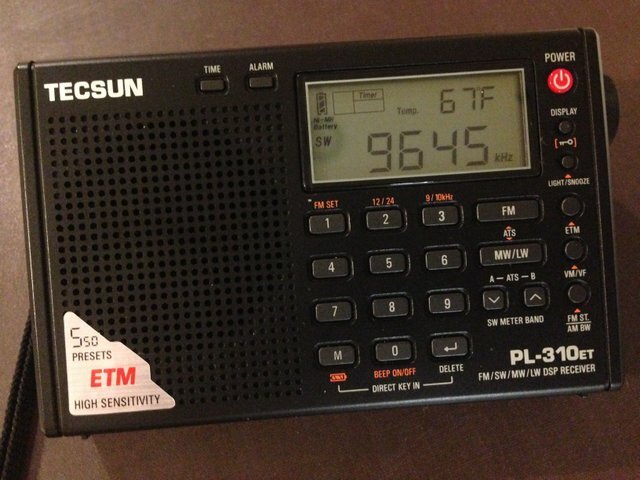 If I didn’t care about the AIR band or NOAA weather radio, I’d be quite happy with the PL-310ET. In truth, you really can’t go wrong either choice. I can say that I now take my CC Skywave on travels more than my PL-310ET. Either of these radios, by the way, would make for an excellent gift. This entry was posted in News, Radios, Shortwave Radio Reviews, Travel, Ultralight DX and tagged Best Portable Shortwave Radios For Travel, best radios for travel, C.Crane CC Skywave, PL-310ET vs CC Skywave, Tecsun PL-310ET, Travel Radios, Ultralight Radio Comparison on December 1, 2016 by Thomas. Very good radios in their class difficult to distinguish apart without going down into the weeds on details, neither one appear to be capable of receiving cw/ssb so that puts them in a standoff, If one had the forethought, the one with BFO that would win hands down. Marketeers fail to understand there sometimes are subgroups that make a competitive advantage because of some seemingly insignificant feature that make a break a sale.